I have volunteered to take part in the CRTC’s bandwidth-measurement campaign, which follows on the heels of similar projects in the EU and by the American FTC. The text instructions are even easier to follow than the image and, indeed, I got it up and working in a minute or two. Everything was working as before, almost. One nifty thing about the Whitebox is that its antennas passively pick up Wi-Fi traffic but only record the bandwidth. It’s not actually a wireless router itself. Ethernet connections do pass through it. As (very) faithful readers may remember, I run a Plex media server on my iMac. I was downstairs and wanted to watch something on the Plex server through the PS3 but the PS3 had lost the media server link. That happens once in a while, but this time the PS3 couldn’t the media server when asked to. That was altogether a more worrisome problem. I rebooted the server on the iMac. Our iPad could find the Plex server but still the PS3 could not. This called for research. Aha! The PS3 use DNLA to access media servers. 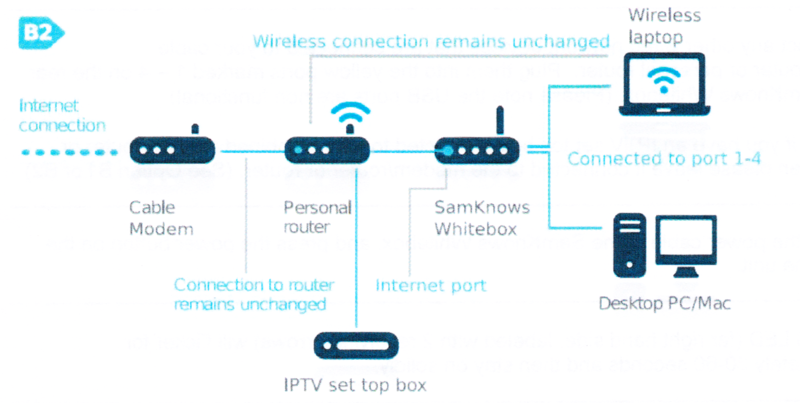 Although SamKnows doesn’t explicitly admit this anywhere, I suspected their Whitebox device does not. And users cannot get into the device to wiggle its settings. I was looking at the LAN structure when I had an idea. The iMac, on Ethernet, sat behind the Whitebox. 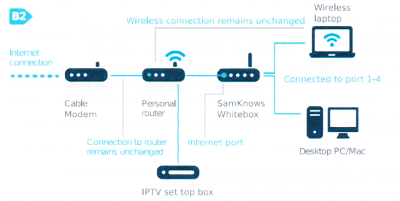 If I moved it to our established router, the PS3 could get to Plex without passing through the Whitebox – but that would mean either going on Wi-Fi (I love me my physical connections) or ignoring the Whitebox entirely, which runs counter to the point of having it. So, I thought, what if I activate the Wi-Fi network on my iMac while maintaining the existing Ethernet connection? Yeah, that works, as the PS3 can recognize Plex through our router without having any of that traffic pass through the Whitebox. Problem solved. SamKnows and the LAN would be a great name for a band.